When I looked at Clark two weeks ago I thought that it was an interesting company, but not a great deal at the current discount. Fortunately my readers alerted me in the comments that there was a little bit more to the story than I thought. 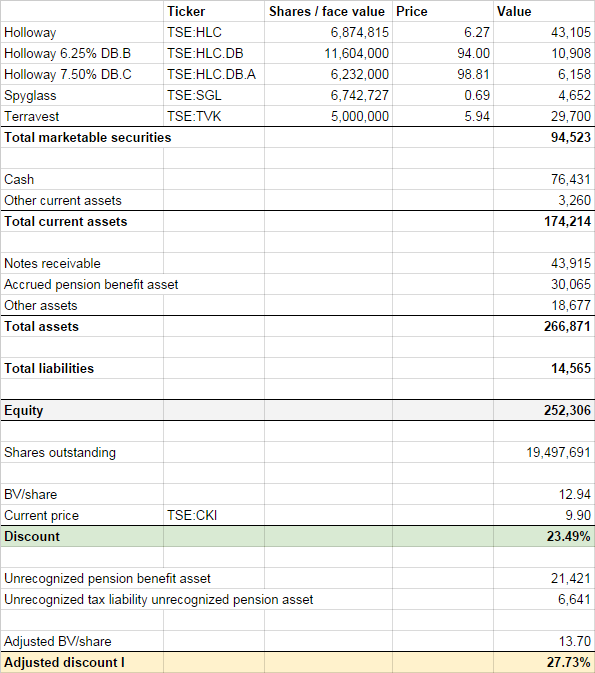 The company has a pension asset that is not recognized in the book value making the actual discount bigger than I calculated, and at the same time there is no tax liability for the pension assets that are on the books (there is only an unrecognized liability for the unrecognized assets). The company is currently on pace to buy back 5% of its outstanding stock this year. Buying one share at CA$9.90 that is worth CA$13.70 generates a profit of CA$3.80. Multiply this number with 5% of the outstanding shares and you generate CA$3.7 million/year. Capitalize this stream of alpha at a 10% discount rate and the value of the share buyback opportunity is CA$37 million. The value of the dividend can be calculated in a similar manner since you can use the dividend to buy additional shares yourself. Since the dividend represents a 4% yield the potential value of the dividend is roughly four fifths that of the share repurchases. This means that Clarke Inc should be trading close to book value. But given the reflexivity between intrinsic value and price this doesn’t mean that the current intrinsic value is CA$13.13/share. The longer the company continues to trade at a discount the more valuable it becomes. This will give shareholders two ways to win. If the discount persists or grows the company will be able to grow intrinsic value at an above average rate while a shrinking discount would imply, ceteris paribus, a higher Clarke share price. Of course this is all assuming that George Armoyan is neither expected to outperform nor underperform the market. While I was skeptical about his abilities/his track record in my initial post on the company I do think it’s more likely than not that he is able to generate some positive alpha. A ten year 14.4% CAGR versus 5% for the S&P/TSX is pretty decent after all, even with lumpy results and a lot of underperforming years. And the most important thing is that you are absolutely not paying anything for this possibility at the current price point. Clarke is not the proverbial 50 cent dollar, but I don’t think it’s wise to focus on a more or less arbitrary hurdle. What’s very important is how certain you are about the undervaluation. A company that you know for certain is undervalued by 10% might be a better bet than a company that you think is undervalued by 50%. One of the biggest reasons that you need a margin of safety is in my opinion to protect yourself against valuation mistakes. Given the relative straightforward valuation of Clarke I think there is a pretty low probability that I’m wrong about the appropriate discount for the company. It also makes sense to be willing to accept a slightly lower discount when you have a little bit of faith in the capabilities in the manager. You could of course try to incorporate this in the valuation model, but that would be pretty arbitrarily I think. 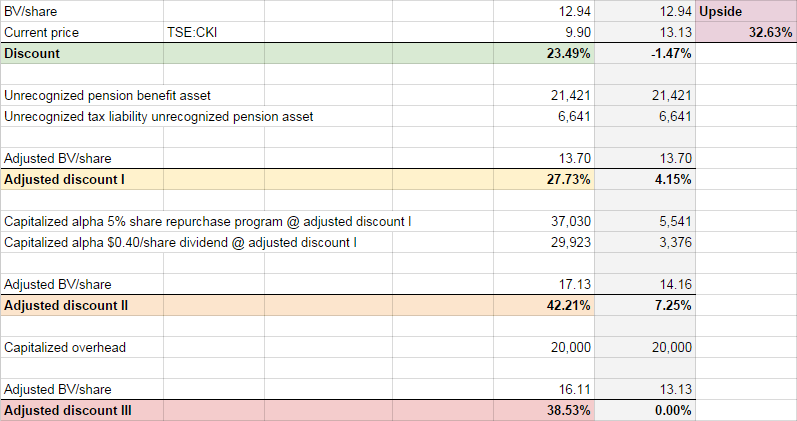 Bottom line is that Clarke is almost certainly too cheap at the current price, and with both a decent share repurchase program and a nice dividend yield there is a solid opportunity for both the company and shareholders to create value. Given the large cash balance after the sale of Supremex there might even be more in the cards than just the current repurchase program. This entry was posted in Portfolio and tagged CKI.TO on December 2, 2014 by Alpha Vulture. This Holloway looks super interesting in its own right. I took a look after reading you post. Exposed to oil patch but seems like there is a lot of low hanging fruit there. Yes, I agree. Holloway looks cheap, although I still haven’t had the time to take a real good look at it.